May 2008 was my last rendezvous with direct heat and a formal trim. And, to promote natural hair growth, I vowed that I wouldn’t use heat for five years. I wanted to see how long my tight curly hair could grow under optimal conditions. I don’t know what the ultimate length will be, but I thought if I moisturized my ends, stopped using blow-dryers and flat irons, and wrapped my hair at night that would definitely eliminate breakage. Then, I would finally discover my terminal length. So far, on this journey, I’ve learned a few lessons. Lesson #1-Impatience makes you lose focus. I want long hair now and it can be very frustrating to be in forums where people show their natural hair growth pictures and have mid back length or waist length hair. Now of course, I never focus on the amount of time and effort it took them to get there but only the fact that their hair isn’t my hair. However, the time and effort is why growth happens. Impatience makes me forget that. However, when I get the crazies it’s always good to have a forum and community of people with similar natural hair growth goals to reach out to. Email someone who has similar goals or has grown their hair out. 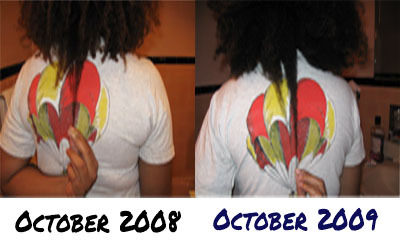 When I almost lost it this summer and was about to go flat iron furious, I reached out to Teri at tightlycurly.com. Because she had already endured years of short hair, then medium hair, then almost long hair, to just about long hair and finally hip-length hair, she gave me great advice, suggesting that I switch focus to preventing damage. I was able to do that and see that my hair really had changed in a year’s time which leads to the last lesson of noting and celebrating progress. Lesson #3--Celebrate and record all natural hair growth. Progress, encouraged me to go on. There were months before I started this journey where I saw no progress, because I was breaking off my hair at the same rate it was growing. However, by taking pictures and seeing actual growth, I was motivated to continue which is key. Motivation will prevent you from going crazy and trimming (or cutting) your hair in a fit of hair anger. So, while it may not be hip length yet, my hair is much longer than it was in May 08. With all of these lessons learned I’m moving on to year two. Already I’ve decided to participate in a Hide Your Hair Challenge from June 15 to Dec 15 at LHCF. Hopefully I will stay honest for four more years. Let’s keep our fingers crossed. Healthy hair, along with natural hair growth, is an important concern for curly hair vixens. Read here about how to have thriving hair strands.